yoyorecreation - Double Straight String Centering Bearing! Yoyorecreation is known for making some of the best performing yo-yos on the market, and they designed their new DS Bearing to the same standards of precision and perfection as every one of their yo-yos. 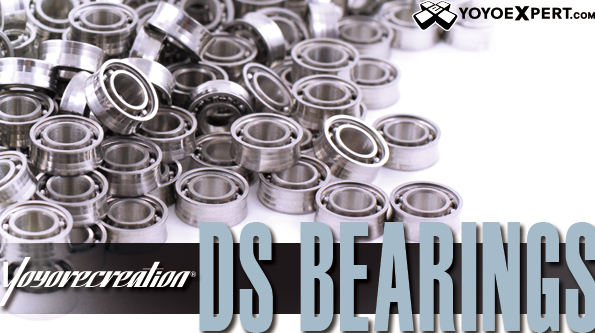 The DS (Double Straight) Bearing is a double angled bearing designed to center the string. It was created to perform at a competition level and that is exactly what it does! The DS Bearing has a more gradual angle than some other centering bearings out there so it gently centers the string during play instead of just forcing it which provides a much smoother feel on the string. With yo-yo design evolving so rapidly and yo-yo contests getting more and more competitive you can't trust any random bearing in your high performance yo-yo - You need an equally high performing bearing. Also now available in Gold and Platinum versions manufactured by NSK Micro! Gold is actually an 18K plated version of the bearing for amazing initial spin times. Platinum is a special chemical coating that can really improve the overall life span of the bearing!